It's another dance competition. I'm in a Best Western in Hayward, not by my photos. Hopefully I'll find time to post something tomorrow. Mike VE2TRV, BoxcabE50, badlandnp and 3 others like this. Some Canadians in Texas back in October of 2006. Mike VE2TRV, BoxcabE50, badlandnp and 11 others like this. 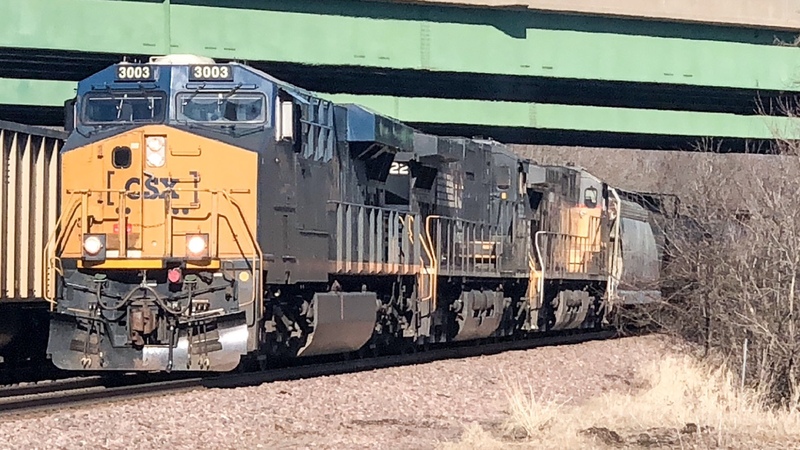 From last week’s outing-CSX 3003 leading a westbound ethanol train on Absolute Blocks at MP 86 on the UP Clinton Sub. Mike VE2TRV, BoxcabE50, badlandnp and 8 others like this. From Wednesday—Ferromex 4696 second out on a westbound stack train east of Lisbon, IA on the UP Clinton Sub. This unit led from Yard Center in Chicago to Global 3 in Rochelle, IL. ddechamp71, Mike VE2TRV, BoxcabE50 and 6 others like this. Lancaster & Chester SW-900 No. 91 switches a feed mill in Richburg, SC on 01/22/2019. She was built new for the road in 1965. Mike VE2TRV, BoxcabE50, badlandnp and 6 others like this. The two CIT's and the white Soo engines are gone from the Kanawha River Railroad. The leases are up. Mike VE2TRV, badlandnp, BNSF FAN and 5 others like this. Great catch. I didn't know SW-900s were even offered that late. I assumed their production stopped in the late 1940s. Northbound at Manchester GA - April 2006. So fresh you could still smell the paint. ddechamp71, Mike VE2TRV, fordy744 and 6 others like this. Mike VE2TRV, BNSF FAN, BoxcabE50 and 4 others like this. UP's GP38-2s get around. That could be anywhere here in the Calif. Central Valley. Had a bit of an ice jam causing this old box to get even more forlorn. Mike VE2TRV, Akirasho, BNSF FAN and 4 others like this. Still "on the property" after all these years. That's an outstanding accomplishment. WPZephyrFan, Mike VE2TRV, Akirasho and 5 others like this. Mike VE2TRV, BNSF FAN, badlandnp and 2 others like this. They keep they're equipment clean-look at the shine on those units!! Compared to the old grain hopper behind them! Their paint scheme is quite striking . I bagged another one in Jamestown that weekend, too. ddechamp71, badlandnp, BNSF FAN and 6 others like this. That many years, already? Wow. Time has flown away! HemiAdda2d and Kurt Moose like this.